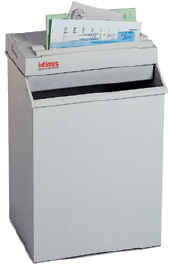 The elegant compact shredder. With high-grade robust technology packed in a functionally styled design- ideal for the home office and individual users. Special Features - Security: Level 2 or 3 - Working width: 230mm - Cutting speed: 21 feet per min - Automatic, via multi-function sensor - Manual via reverse button when overloaded - Opening for general paper waste. - Cutters made of solid, hardened steel.155cc is a cross cut version which shreds at 4 x 28mm or 2 x 14mm.